Nothing to fear but…each other? My apologies in advance: I think I’m going to be posting a few (hopefully not too long) blogs in succession to try to make up for the fact that I can’t blog from work any more, and school work (and the desire to not be on a computer after a day of work) after coming home have been preventing me from blogging like I used to. 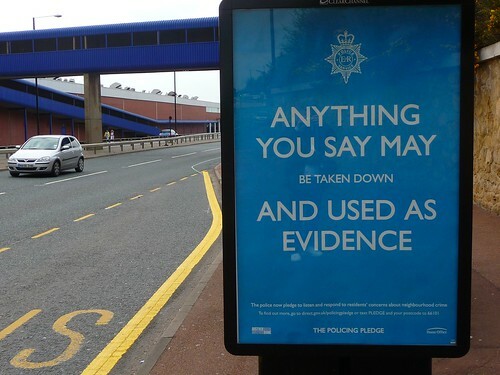 David Byrne’s snapshots of UK police posters. Make your own paranoid British terrorism poster! The fine print in that one’s dead-on. Previous PostFinal fraking BSG.Next PostCan they GET any more pathetic, in both senses of the word? Pingback: CelticBear’s Musings » Blog Archive » Can they GET any more pathetic, in both senses of the word?